← "Now let me get this straight…"
I have a really hard time with straight lines and accurate measurements. In wood shop in the seventh grade, my old-fashioned bottle opener came out kinda janky. It worked, it didn’t look terrible, but the fit and finish left something to be desired. The problem hounds me to this day. I think in big pictures, for the most part; sweeping, grandiose landscapes. Measuring requires focusing on one or two details exclusively. It’ll be good for me. I need to slow my lemur-like mind down to a more meditative state. 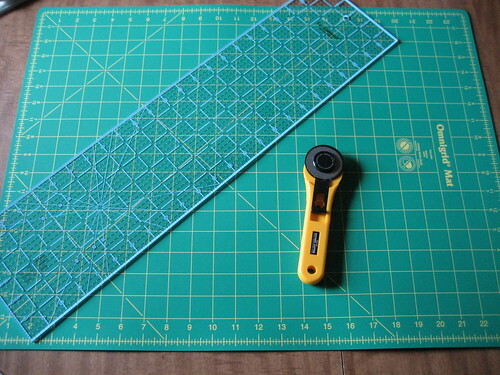 My first project yesterday was a simple placemat. Starting small. 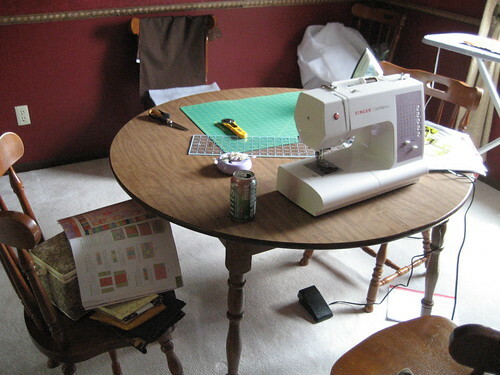 I picked out some fat quarters in fabrics I found appealing, read over the instructions (such as they were – the book assumes one knows how to sew,) set up on the dining room table and dove in. 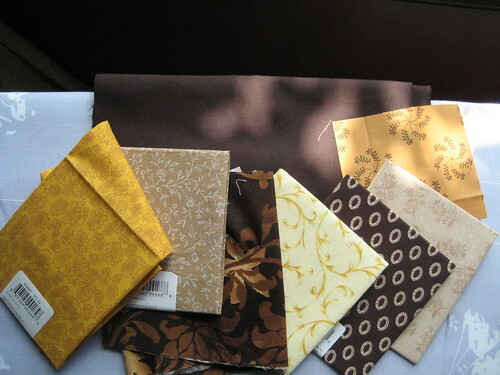 It took me between three and four hours to complete – and when I say “complete,” I mean, “get it done to the point where I couldn’t do anymore because I don’t know how.” All it lacks is the binding or border or whatever it’s called that covers the edges. I have this somewhat crooked, oddly-pleated placemat-like sandwich with raw edges. Once I figure out how to get those suckers on there, perhaps I’ll tackle the next placemat in the series, provided I haven’t wasted too much fabric Getting It Wrong. 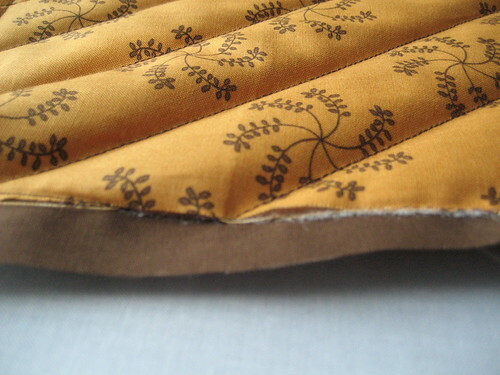 I think I might know why it’s all buggered up in terms of odd puckers and pleats – it looks like one does not first sew the backing on around the edges. 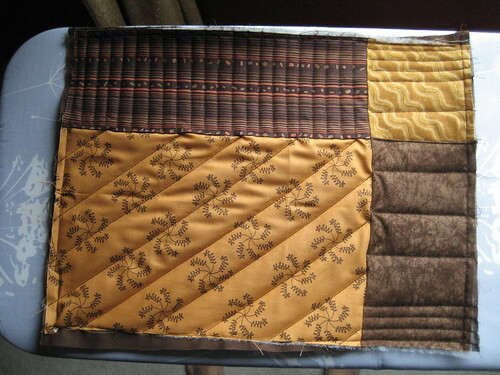 One pins it, from the center out, and then simply begins the quilting process. Sewing the edges means there’s no room for the fabric to move into. Aha. Ok, one lesson learned. Check.